Row 01: Peaches and Warmer Pinks. Only the one on the far right does not adhere too well and disappears as you rub. Row 03: Reds and Corals. These are deeper and redder than they look here. Row 04: Violets. Outstanding row of purples. Row 05: Ocean blues. High pay-off, like the violets above. Another standout row of shades. Row 06: Teals and Mints. Glorious, gorgeous shades. Row 07: More turquoise blues. 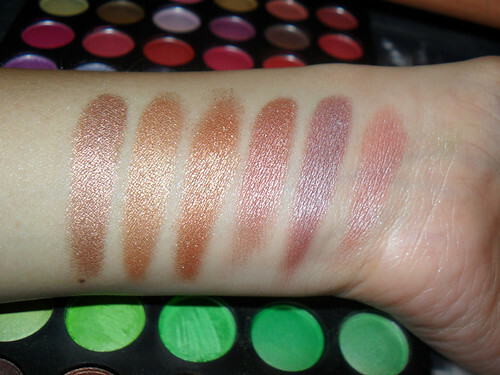 The 2 mattes aren’t particularly fab, but they’re ok.
Row 08: Without a doubt the worst row in the entire palette. 2 or 3 of these have no payoff at all and it took lots of scraping with a metal spatula to get any color onto my arm. Row 09: Drop-dead gorgeous browns and bronzes. 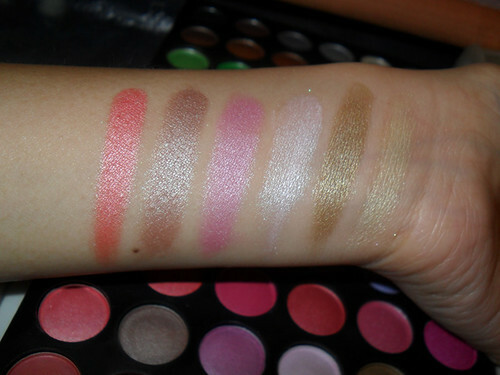 Probably the ones I will go to most in this palette. Row 10: Random mix of neutrals. But that brown is a nice shade of terracotta with minty green highlights. Not quite as straight-edge as it appears in its pan. 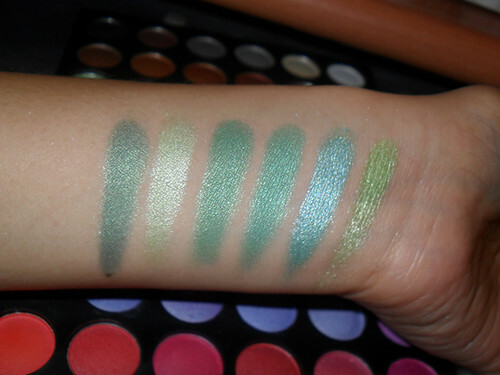 For more Palette pictures and swatches, click here. 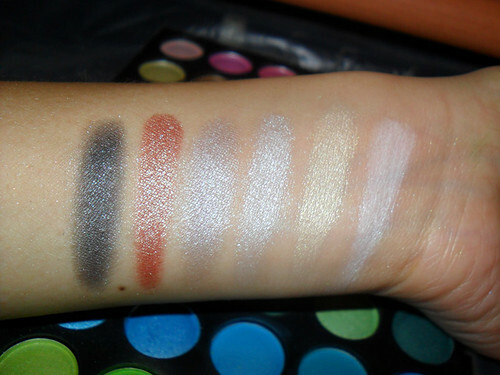 Now I obviously have not tried all the colors on my eyes, but so far, I’ve found the palette to be worth the money (usually ranges up to max of USD 35), considering you get to play around with 120 shades, most of which you would never buy individually. 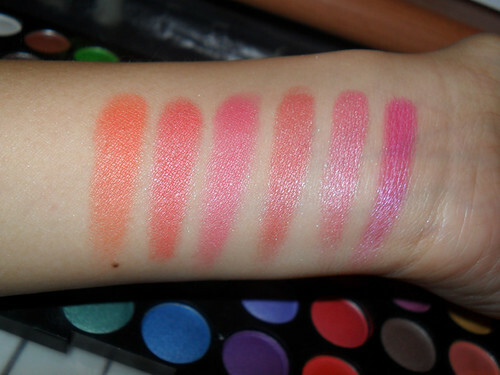 This allows you to experiment and discover new favorite shades which you can then purchase in full size. As mentioned before, the textures range from super-soft and crumbly to hard as marble. However, most of the shades are ok to work with. You may need a range of different brushes to get the best control and payoff. 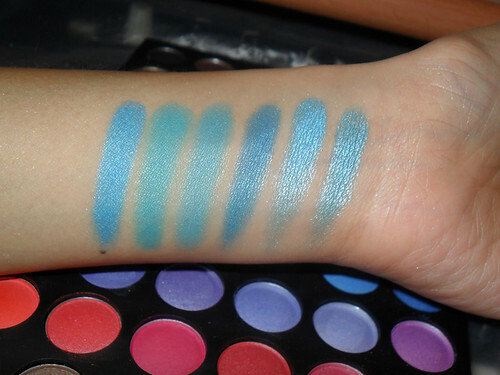 I’d liken this to POP Beauty eye shadows in that they aren’t super fine-grained to the touch, but they apply well and look good on. 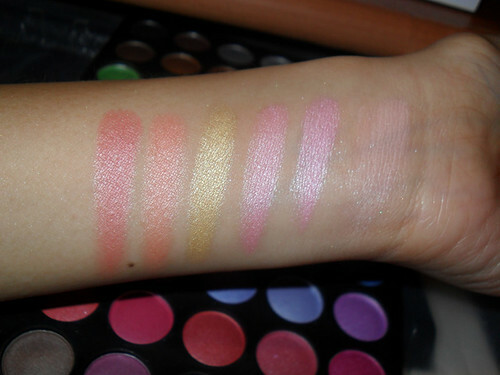 The matte shades also take some time to really blend with each other, but I suppose that’s common. 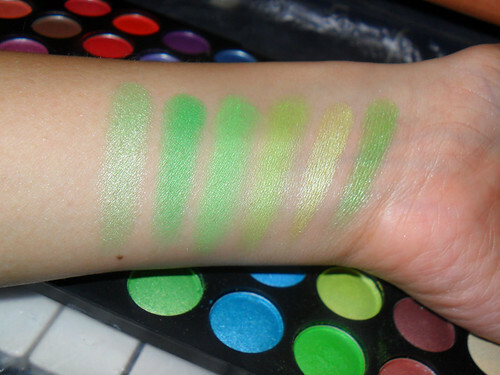 I also have not had much issues with fallout for most of the shades, but then I do prefer to “roll” and pack the color on, rather than sweep. 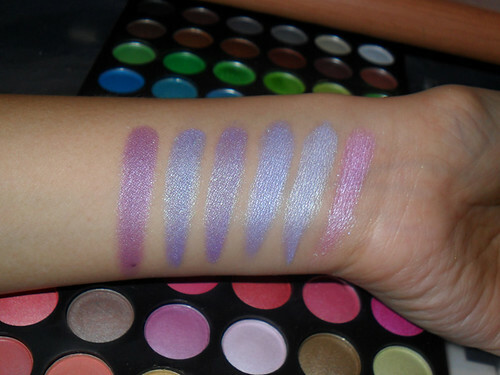 Do note that this palette does contain mineral oil, so if you have any mineral product allergies, avoid this. Otherwise, go for it. UPDATE: This has worked VERY well applied with a wet brush (I tried it with MAC Fix+, as well as oil-free eye makeup remover - both work, but I like the remover better as it gets your brush saturated with color faster). It’s a bit like painting on Mehron colors. Except you have a 120 color artist’s palette - woohoo! 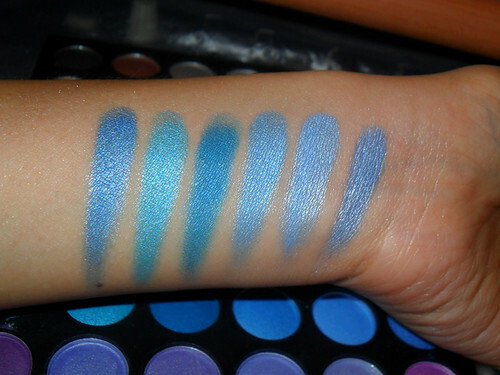 I would only recommend this for eyeshadows that have zero to no payoff though. This is because dampening them with water or mixing medium may sometimes cause the shadows to seal over, which can end up “fossilizing” all of them. I haven’t found out if all mediums cause this, or only water, but I’ll update if I find out more. What brand is this from? I recently bought one from BH Cosmetics. Thanks for this great post; it was in depth and honest, and I'll be keeping all of your insight in mind when I get to using mine. I think your blog is wonderful by the way.. I've read a few of your first posts and it's kinda funny to see that you were hesitant to wear bright pinks on your lips and on your eyes but now you have no qualms about it at all! Hi Carly, I bought this from the 120 palette suppliers in China. You can locate them on ebay or sometimes cheaper on Aliexpress.com, but there are quite a number of cheats there, so I don't really recommend it. I got burnt once where they never shipped the item to me, and Alibaba sided with the vendor and ignored me when I requested for proof of delivery. Definitely not buying from them again! It's better to just get yours from BH and save the worry and risk.